By customising your office desk or office chair design, you can create a cohesive and stylish home office or workplace. 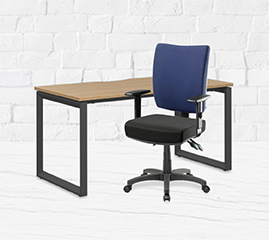 Choose from a range of our office chair designs and customise the colours, arm rests and back support. You can also design your office desk to suit your space. Highest quality, guaranteed. Our furniture comes with 10 years of warranty, from best-in-class manufacturers and suppliers. Our chairs have satisfied the AFRDI Blue Tick Certification Scheme's performance and test-based requirements. Business grade materials help keep your workspace looking its best for longer. Ergonomic for 24/7 use. FSC-certification ensures we minimise the use of products sourced from unsustainable forest practices. Buying in bulk reduces time reordering plus receive great savings you can put back into growing your business.